Samson's Classroom is an engaging online learning program great for children in Kindergarten - 5th grade. There are three areas of learning that Samson's Classroom focuses on three core building blocks: sight words, spelling and reading comprehension. Meet Samson (below) the adorable dog who guides children on a learning adventure. Samson is lots of fun to learn with because he is silly, encouraging and engaging. Getting started with Samson's Classroom was very easy especially since there are several helpful videos to get you started. We received a family subscription so I was able to set up two accounts one for Gwyn (age 6) and one for Rowyn (age 5). And I also have my own teacher/parent account. However only Gwyn ended up utilizing the program because Rowyn found it too difficult since he is still working on mastering the alphabet and only just starting to learn some words. Gwyn enjoyed being on Samson's Classroom and found it very fun but she was really only able to utilize the Sight Words portion of the program on her own. The Spelling portion she found too difficult and the Reading portion she needed me to read to her. She really liked having her own account where she could easily log into the desired learning area she wanted to work on as well as view her own scores. She found navigating between each learning area, step, list, level, etc very easy. 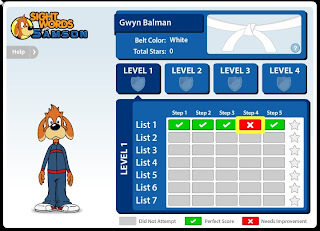 To encourage children to continue learning there are several award systems in place like: Belt Color advancement for achieving Stars (children obtain stars by getting 5 green checks on each list). Printable certificates which pop up after successful completion of each list step. And printable level certificates which can be printed here. Samson's classroom is very consistence and uses the same learning games throughout each learning area so children will always know what to expect. It is so wonderful to have a separate teacher/parent account. I am able to log in and see each child's progress and scores on each learning area. There is also a fabulous spelling list creator. There are 5,000 words in the Samon's database (if you wish to add a word that is not in the database you will be prompted to send a request for it to be added in a future upgrade. This is necessary because words are spoken and spelled throughout the various games). We have a reading and spelling curriculum that we absolutely love but Samson Classroom was a great supplement on days we weren't able to get to our curriculum. With the spelling list creation function I was able to go in and create lists specifically for the words we are currently learning with our curriculum. I also was able to create lists of vocab words to go along with our unit studies. Are you ready for a breakdown of each learning area in Samson's Classroom along with our thoughts? As indicated above this is the section that we used the most. There are 5 great activities for each list of words. I really liked that there was an option to "hear again." Gwyn is still working on her memorization skills and it takes her brain awhile to compute what she just heard so having the "hear again" feature really helped her not get frustrated and angry. There are 4 levels all together each containing 7 lists...that's 28 lists in all. Yup hours of fun! 1) Learn Words - For each list children will learn 8 sight words. The words are spoken, spelled and used in a sentence. 2) Build Words - In this game children pick letter tiles to spell each word. 3) Identify Words - In this game children select the correct spoken word. 4) Spell Words - In this game children spell the words with alphabet letter tiles. 5) Missing Words - In this treasure chest game children select the correct word to complete the sentence. Words with similar sounds and spellings are used to make children really think about their choice. This game may be frustrating for children with dyslexia. Gwyn found 2 of the 3 games too hard in this section and was getting very frustrated. The time limit was too quick on one of the games and the other had difficult controls. So for this section of Samson's Classroom I just encouraged her to go through the Spelling List and Missing Letters game. Again you can either choose to use the supplied sight word lists (there are word family lists, grade specific lists, sight word lists and more) or you can create your own. Gwyn did much better with the lists I created since they were words she definitely knew. 1) Spelling List - Children go through the list and click on each of the words. For each word they can hear the word, listen to the word in a sentence and have the word spelled. 2) Missing Letters - This was Gwyns favorite game. Children hear a sentence and then find the missing letter (s) to correctly spell the word. Samson karate chops the board in half if the child selects the correct letter (s). If they are wrong the board doesn't break and he hurts his hand. 3) Spelling Scramble - This was one of Gwyns least favorite games. The controls were very difficult for her and she began yelling at the screen. I tried to help her and also became frustrated. The game uses the left and right arrow keys only and the object is to collect the letters and then use them to spell the words. Apparently the game uses Samson's perspective view which is a hard concept for children (and even some adults) to understand. Samson's Classroom did indicate to some other TOS Reviewers that they are trying to work on a "fix" for this game. 4) Crunch Time - Gwyn didn't even make it past one word on this game. Children are initially given about 10 seconds to type the spoken word correctly in the blank space. If the child doesn't complete the word the Walrus eats the iceberg and Samon falls into the water. More time is given though for remaining tryies if students don't break down in tears after the first attempt. This is a difficult game for children who don't do well with thinking fast and time limits. I do like that it incorporates typing skills though. There are four levels of reading in this learning area. Because this section is for developing reading comprehension it is not auditory. There are fiction and non-fiction passages that can be read and students can pick and choose what passage they wish to read. I am a BIG advocate of reading comprehension and we actually do it with our primary reading curriculum. Neither of my kids is reading completely on their own especially passages this large so I read it to them and then read the comprehension questions and answers and let them answer. The comprehension questions (there are about 7 in each passage) are wonderful and cover lots of details like feelings, colors, word meanings, numbers, purpose of story, etc. If a question is answered wrong children may try a second time. The second time the paragraph where the answer can be found is highlighted in red so the child can easily re-read to find the answer. When children master a passage they earn Hammer Time Swings to play Hammer Time a fun arcade game. If a child wishes to go back through a particular passage that they did not obtain a 100% score on parent may clear the score from the teacher/parent account. Need more information? Read 10 Reasons To Purchase A Samson Classroom Subscription. You can also try a DEMO of Samon's Classroom. There is also a very good, short video demo. Samson's classroom even has some GREAT freebies like lesson plans, worksheets and articles. Both children really enjoyed the worksheets and sight word printable games. Samson's Classroom is a great supplement to our current reading and spelling curriculum. It was a fun way for Gwyn to work on her reading skills on days we were on the go, didn't have time to do our curriculum, etc. We will definitely continue using portions of Samson's Classroom. Because of the great auditory instructions Samson's Classroom is great for all 3 learning styles. I loved the consistency and ease of use throughout Samson's Classroom. The price for a subscription is very reasonable but I do recommend you check out the demos especially if you have a beginner reader because the program may be too difficult. I liked learning the words but the games were too hard for spelling. I like Samson he is cute and funny. There are several pricing options: Home Plan (1 user) $30 per year, Family Plan (2-4 users) $50 per year, Classroom Plan (5-30 users) $80 per year and more. Click here for more Samson's Classroom reviews from the The Schoolhouse Review Crew. *Disclaimer - As part of the TOS Review Crew I received a 1 year subscription to Samson's Classroom in return for my honest review. Please note that prices indicated in the post are subject to change. I was not compensated for my review and all opinions are our own! Many of the links found on my side bars and in my blog posts are affiliate links. As a result, I might get paid money and I will most likely spend the money on homeschool supplies.